Miércoles 21 de Marzo, después de unos cuantos meses sin hacer excursiones al campo volvimos a realizarlas, pero esta vez en un nuevo lugar y con un nuevo proyecto que tiene La Herradura, donde muy pronto tendrán muchas noticias lindas. On Wednesday the 21st of March, after many months of not having undertaken excursions to the countryside we once again returned there. This time however we went to a new place and undertook a new project of La Herradura, from which you will soon hear many enticing things. Los estudiantes salieron de la escuela con Margo a las tres de la tarde y fueron rumbo a un pueblito pequeño llamado Tapia en el departamento de Canelones a 72km de Montevideo. Antes de llegar al lugar se meten en un camino de tierra pudiendo apreciar el bonito paisaje que ofrece la naturaleza. The students left the school with Margo at three in the afternoon and went to a small village called Tapia situated in the department of Canelones 72km from Montevideo. Before arriving at the place they drove on a dirt track around the countryside in order to appreciate the beautiful landscape that the countryside of Uruguay offers. 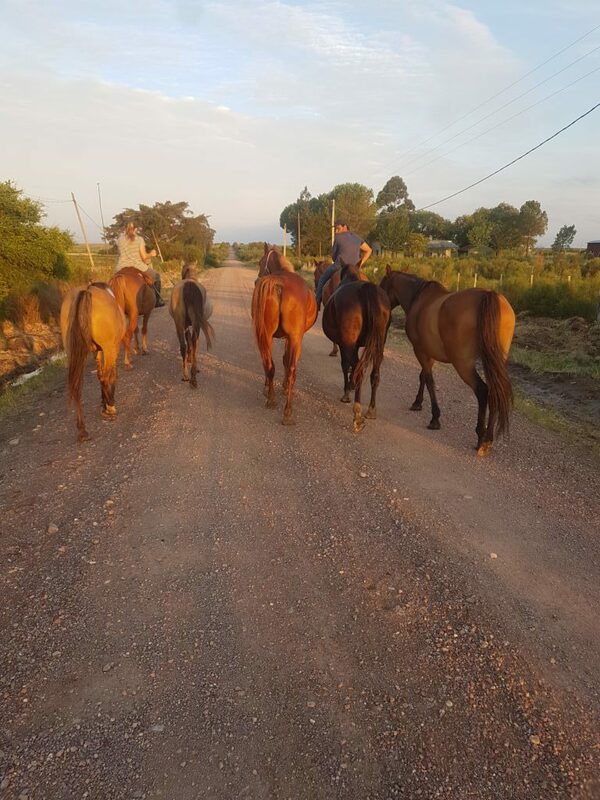 Una vez que llegaron Rebeca y Stephanie los estaban esperando con los caballos listos para hacer el paseo dividido en dos tandas ya que por ahora tenemos solamente dos caballos para montar y el resto están en proceso de doma, así que esperamos tenerlos listos prontos para que puedan disfrutarlos al igual que nosotros. Once they arrived Rebeca and Stephanie were waiting for them with the horses ready to be ridden. For now we only have two horses to ride and the rest are in the process of dressage, so we hope to have them ready so they so that they can be ridden as well. Los que se quedaban en la casa salían a recorrer el lugar y a conocer el resto de los animales. Tenemos un pequeño monte indígena (bosque típico del campo uruguayo), donde escuchar los pájaros es una cosa increíble. Siempre pensamos que bonito es apreciar las cosas que nos deja la naturaleza, ¿no les parece? Whilst the others were out riding, those whose turn it was to stay in the house went out to visit the place and it surroundings and got to know the rest of the animals. We are situated next to a small indigenous forest (a typical forest of the Uruguayan countryside), where listening to birds is an amazing pastime. We always think about how beautiful it is to appreciate the things that nature offers us, don’t you agree? Cuando todos habían terminado de montar, les esperaba una deliciosa merienda casera con una torta dulce, galletas de campo, mermelada, café, té, entre otras cosas ricas y como no puede faltar en una merienda uruguaya el mate donde todos pueden probar y compartir una mateada. Este es el momento perfecto para relajarnos, conversar y respirar aire puro que no encontramos en la ciudad. Tuvimos la suerte de ver un precioso arcoíris por lo tanto la tarde no podía ser más perfecta. When everyone had finished riding, a delicious homemade snack was waiting for them consisting of a sweet cake, country biscuits, jam, coffee, tea, amongst many other indulgent things. It is not possible to have a Uruguayan snack without Mate so everyone was able to try and share the Mate that was prepared for them. This was the perfect time to relax, talk and breathe fresh air that one cannot find in the city. We were lucky to see a beautiful rainbow in the afternoon so the experience could not have been better!. Terminamos de merendar y nos fuimos al bar del señor Peralta que está a menos de una cuadra de distancia. Peralta es un señor de 84 años que tiene el bar allí hace mucho tiempo. Todos los gauchos y las personas que terminan de trabajar en el campo pasan a tomarse una copita o una cerveza. A él le encanta recibir personas y hablar de historias que le sucedieron a lo largo de su vida. Es una buena oportunidad para practicar su español con él y con los que se encuentren en su bar. We finished our picnic and went to Mr. Peralta’s bar, which is less than a block away. Mr Peralta is an 84 year old gentleman who has had his bar there for a long time. All the gauchos and the people who finish working in the fields come here for a drink or a beer after work. He loves hosting people and talking to them about stories that happened to him throughout his life. It is a good opportunity to practice your Spanish with him and with those who are in his bar.